Outlining the practice and benefits of meditation and mindfulness in combination with the use of essential oils, Heather Dawn Godfrey explains how these practices hone and sustain a conscious awareness of “being” in the present moment, focusing attention on what you are sensually experiencing and leaving no space for regrets, traumas, fears, anxiety, or anticipation. 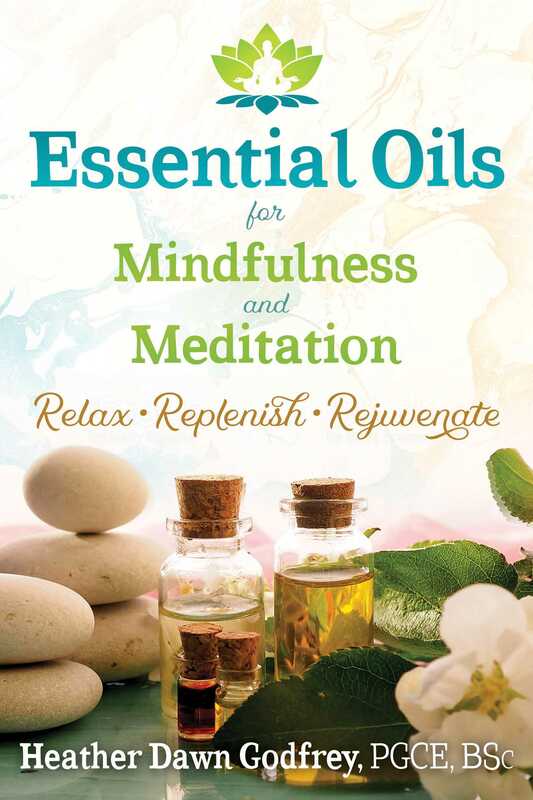 Providing the latest scientific research on the restorative, rehabilitative, and psycho-emotional healing effects of essential oils, she explains how the sensory experience of odors can immediately draw your attention to the present moment, trigger a specific state of consciousness, such as a deeper meditative state, or offer a way to regain composure quickly when dealing with life’s ups and downs. Essential oils possess numerous qualities that can support and enhance wellness and a sense of well-being. They may improve mental clarity and concentration, instill a sense of feeling calm and uplifted, energized and awake. They are perfect meditation companions. Essential oils are highly concentrated, volatile, odiferous phytochemical derivatives extracted from various parts of certain plants, trees, and shrubs: for example, rhizomes and roots, stems, leaves, flowering heads, seeds, wood (stumps, trunks, heartwood, sawdust), twigs, bark, resin, needles, berries, blossoms, fruit, rind, and grass. Not all plants produce essential oils. According to Tisserand and Young (2014) and Lawrence (1995), there are an estimated 350,000 plant species existent throughout the world, of which just 17,500 (5%) are aromatic. Yet just 400 of these aromatic species surrender essential oils suitable for commercial use. Half of these are specifically cultivated for their essential oil while others are grown, managed, and harvested in the wild. Many essential oils are produced as a by-product of industry (for example, citrus oils are produced for the food, manufacturing, and perfume industries). How Does the Brain Respond to Essential Oils? The brain is responsive to external sensory input and neurological stimulation and facilitates internal homeostasis, environmental awareness, consciousness of a deeper sense of being, and relationships with other people and the external world. Fragrance detection triggers numerous neurological, physiological, emotional, and hedonistic responses at the same time, which are difficult to disentangle. While it may be difficult to prove or explain specifically how essential oils affect the brain, numerous studies demonstrate that their vaporizing odorous molecules do instigate neurological responses that appear to affect mood, emotion, memory, concentration, and cognition (either via inhalation or circulatory absorption), even if this influence is temporary. Studies using animals, such as mice, although ethically controversial, eliminate many potentially influential subjective psycho-emotional variables when exploring the basic physiological and behavioral effects of essential oils, and provide very useful indications. However, these studies do not completely reflect the real complexities of true life scenarios when applied to humans, where the idiosyncratic psycho-emotional and hedonistic responses to essential oils contribute to the outcome of their actions--and/or, for that matter, conversely, the complex influence essential oils actually have on the individual’s psyche, cognition, and physiological function. Essential oils can be used prior to meditation as part of your preparation process (perhaps in a bath, in an oil blend to be applied in self-massage, or simply environmentally vaporized in a diffuser). They can be used during meditation to aid concentration, focus, and alertness, and to calm racing thoughts and ease restlessness (perhaps applied as a personal perfume or, again, diffused into the atmosphere). Following meditation, essential oils can be used as a memory cue, a gentle reminder to return attention to the here and now. Their physiological and psycho-emotional uplifting, grounding, and balancing qualities are also beneficial at this time. Your selection of essential oils will be personal and pertinent to you and what you require or need; there is not a “perfect blend” in this context, only the one that works best for you at any given moment in time. Your own nose will help you discover the alchemist within; your instinct is a good starting point. As a very general guide to get you started, woods and tree resins, roots and rose blossom feature among the traditional scents employed to support meditation and prayer. Woods and flowers/blossoms in combination are balancing and uplifting. Woods aid breathing. Resins and roots are grounding. Spices and citrus oils are stimulating. Herbs are balancing; some are more stimulating (rosemary, for example), some more relaxing (marjoram, for example), some are both, for example lavender and patchouli. – Sophie [Petit-Zeman] Olszowski, Ph.D., Director of SPZ Associates LTD.